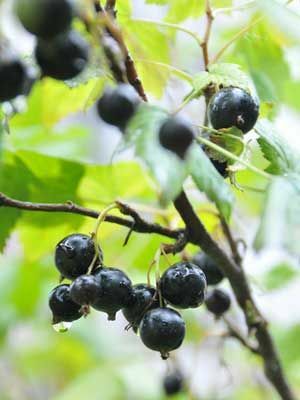 Black currants grow best in locations that receive morning sun and afternoon shade, or dappled shade part of the day. Older varieties of black currants can host a disease called white pine blister rust that is devastating to white pine trees in North America. Plant only resistant varieties including ‘Consort’, ‘Coronet’, ‘Crusader’ or ‘Titania’. In winter, prune out old branches close to the ground. Mature black currants bear best on one and two-year-old branches. Harvest fruit when they are dark and ripe, and chill immediately. Black currants freeze very well.